I'm trying to blog from Flickr again to see how it goes. This is simply a pic of our murder mystery dinner and everyone dressed in character. 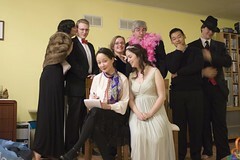 I love murder mystery dinners and can not wait until the next one. I'm sad that Paula and Tom won't be there though.